Aren't those colors gorgeous? That's the benefit of having a visual artist do your set. Margret Hugi-Lewis is a genius. Her inspiration was the work of Paul Klee. Those hues were the inspiration for one of the few things I had time to cook last weekend, since we were in technical rehearsals. This grapefruit sorbetto is everything a sorbet should be: tangy, lightly sweet and the perfect palate cleanser. See what I mean about the color inspiration? Wish us luck with opening weekend! Although we've had our ups and downs, we are ready for an audience. I even teared up a little last night at the end of the show, it's so darn beautiful. 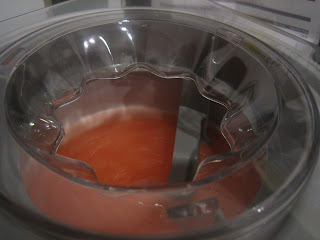 A quick note on the grapefruit juice: I used a combination of fresh and bottled. If you are using all fresh, you should increase the amount of granulated sugar to a quarter of a cup because the fruit is so tart. If you are using bottled juice, I would omit most of the sugar but taste the mixture before you freeze it and adjust as necessary. Combine the pectin and granulated sugar in a small bowl and stir. In a small pot over medium heat, combine the corn syrup and 1 cup of grapefruit juice. Heat to a simmer, then whisk in the sugar-pectin mixture. Keep whisking until the pectin is dissolved, about two minutes. Remove the pot from the heat and set aside. In a medium bowl, combine the remaining grapefruit juice with the lemon juice. Bit by bit, whisk in the hot sugar mixture. Keep whisking until the mixture is smooth. If you are using fresh grapefruit juice, you may wish to strain the mixture at this point to ensure the seeds and pulp are removed. Chill the mixture in the refrigerator until completely cooled, then whisk it again and pour into the prepared bowl of your ice cream maker. Churn for about half an hour, or until the mixture is completely smooth. I am glad you posted this, I have a ton of fresh red grapefruits in my yard still waiting to be picked. Now I something to make with them. Sounds refreshing. Looks delicious great idea for Hot summer day,I'm ready :) lovely color too !! I'm so happy you love grapefruit as much as I do. This looks great! That set is just beautiful! But so is this sorbetto. Mouth-watering! 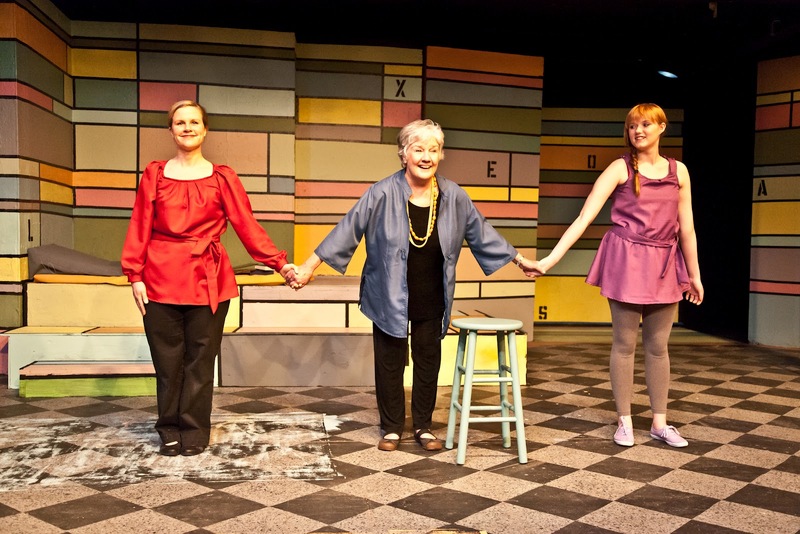 Your grapefruit sorbet does have a wonderful hue, just like the colors of the set of your play! I am sure the opening night will be a success. Have a nice evening! I love learning new things to do with grapefruit! And yes, the pictures are great . 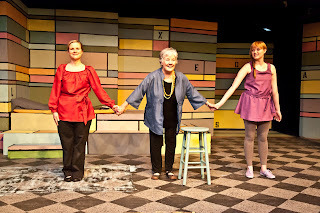 . . good luck with the play! The colors and set decorations ARE stunning...as is the sorbet! I love colors esp the bright and bold striking ones as seen in the pics attached. 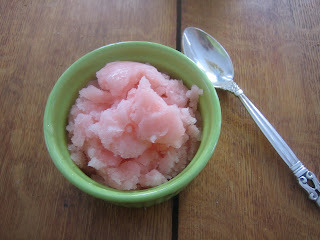 Sorbet made from grapefruit should have been wonderful in taste and your pics again says it all. I like anything home made rather then the easy way out of buying the ready store ones. Best of luck on the weekend opening and hope all will turn out great and fantastic. The colors are phenomenal! Very eye catching indeed! I have to admit I am not much of a grapefruit fan, but perhaps if it was a little sweeter in sorbet I could get my taste buds to enjoy it! I love the color that inspired your sorbet. It will be such a refreshing end to a meal. Perfect sorbet! I just made some too. I love grapefruit right now too. So refreshing! Yum! I have never made sorbet before, not even ice cream. Must get an ice cream machine one of these days. Good Luck! Those colors are just gorgeous! And the sorbet looks and sounds totally amazing! Grapefruit sorbetto I would imagine to be crisp, fresh and light! I would love this with some of the mint in my back yard! I love all those colors. That sorbetto looks brilliant. I hope the play is as well. 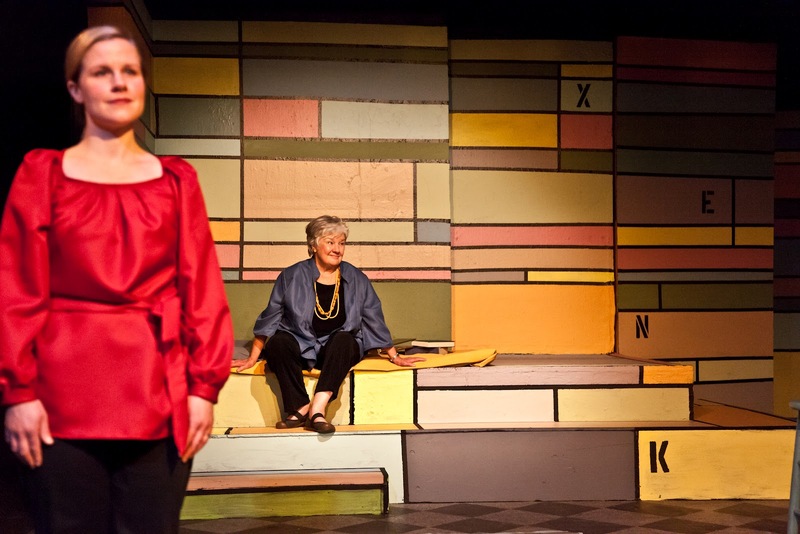 Love the set design. Best wishes!!!! What a gorgeous colour, I like the purple. Grapefruit Sorbetto, seems interesting, will try it out! Looks super delicious summer is start in Thailand,I'm ready :D lovely color too !! Grapefruit sorbetto sounds wonderful. Grapefruit adds a wonderful flavor to anything! Hope the performances went well this weekend! The pictures look great! A grapefruit sorbetto sounds wonderful - tart and sweet. Yours is a beautiful color. Enjoyed the post! Congrats and hope the opening weekend went swimmingly. Gorgeous grapefruit sorbetto - love the sweet/tart combo. Congrats! And I can only imagine how refreshing that sorbetto was! You've got such a great blog and you seem like a really wonderful person! Don't feel obligated to follow the rules, just wanted to let you & others know how fantastic your blog is! I hope opening weekend went well!!! The pics are gorgeous and I bet it was an amazing production!! The sorbet looks great, and a perfect pre-play week treat! Hope your week is off to a great start!